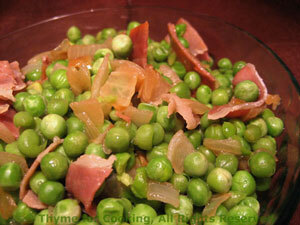 Peas with Prosciutto, Thyme for Cooking gourmet vegetable side dish. I try to keep prepared, canned and frozen food to a minimum, but some foods, like peas, I think are actually better frozen; as well as difficult to get fresh. Heat oil over medium heat in small skillet or saucepan. Add shallot and sauté until tender, about 5 minutes. Add peas and stock, cover and simmer until peas are hot and tender, about 5 minutes longer. Uncover, add Prosciutto and simmer another 3 minutes. Serve.